Warning: The pictures in this article will invoke hunger pangs, salivation, and a possible sudden urge to go to Italy. This is normal, but if you do not want to experience any of these sensations, you may want to go back to the gardening section. Everybody has memorable moments in life - those events or experiences that stay with us, that define us, that change the way that we look at the world. My wife and I had one of those experiences when she was pregnant with our oldest daughter. We took a pasta making class in Italy. Yeah, I said in Italy. 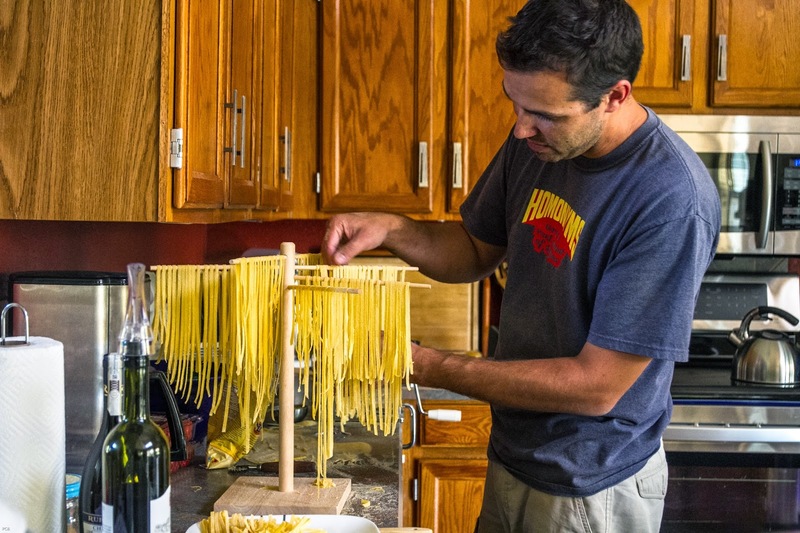 After I took my first bite of freshly made pasta, I looked at my wife and said, "Just think, for the rest of our lives, everything that we eat will be worse than this meal." It was that good. However, that statement was not entirely accurate, as we continue to make homemade pasta. And now I am going to share that experience with you. Our Tuscan guide, Enzo, was extremely knowledgeable and opinionated about all things Italy, food, and wine. As we prepared to make pasta in the cellar of a 15th century Tuscan villa, Enzo said, "Before we do anything, we need two things. Wine, and Italian opera." There is something about a good Chianti and Pavarotti that can make even a Red Baron pizza taste like authentic Italian cuisine (my wife hotly refutes this statement). And the one- two- punch only further enhances actual Italian fare. This is a complete Italian Feast! There are a couple of items that you will need. First, you will need a pasta cutter. This is the machine that rolls out the pasta and cuts it. It is essential. We used an Atlas cutter in Italy. Since Enzo said it's the best, we bought the same one when we got home. It has been making pasta for the past six years and is still going strong. 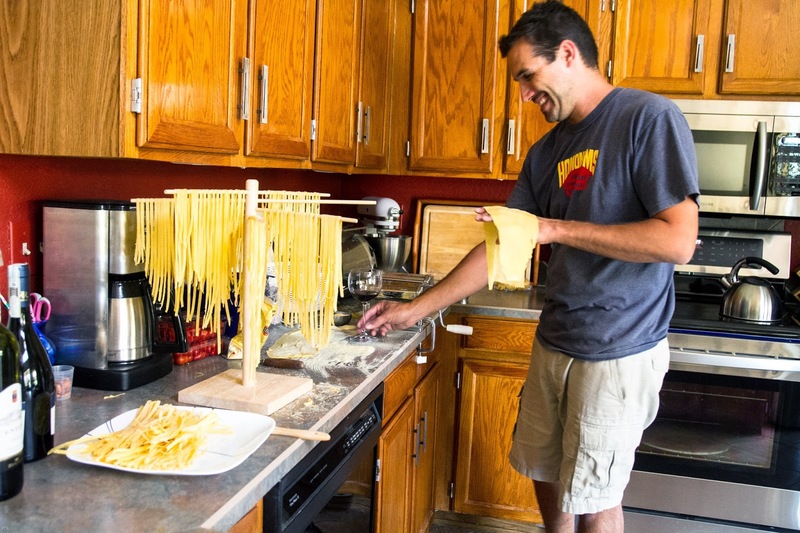 You will also need a pasta drying rack (see picture below). You can get by with some creativity with this (coat hangers, your kids' fingers, string zig zagging in your kitchen). 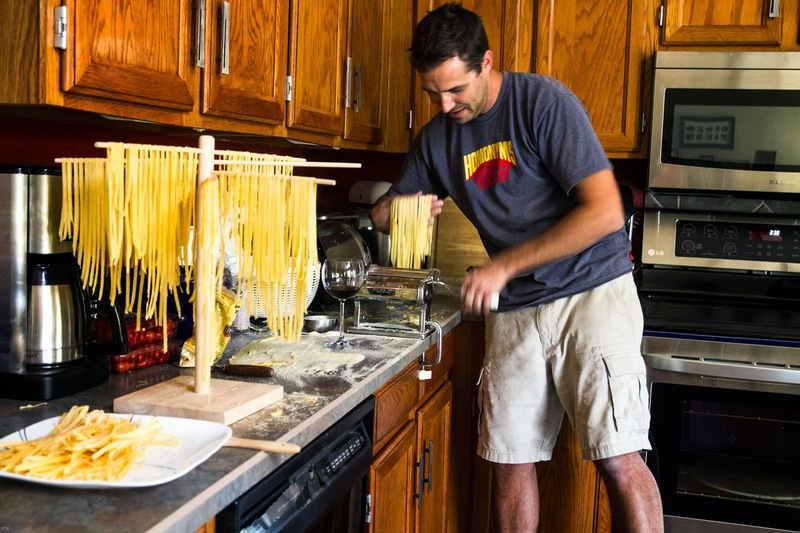 However, after a few months of hanging our pasta on a clothes drying rack, we broke down and bought the real thing, and we've never regretted it. 1. Pour a glass of Chianti and turn on some Italian opera. I prefer Pavarotti. 2. Start by measuring out 1/2 cup semolina flour on the counter (or plate). Add a dash of salt, and make a well in the center with the egg. 3. Crack the egg into the center of the well. With a fork, begin beating the egg, gradually incorporating more and more semolina flour. If the egg begins to escape, scoop it back into the dough. Once the dough is somewhat doughy, you can begin working it with your hands. You want this to be only slightly sticky, yet not too hard or solid. Add a sprinkle of additional semolina if necessary. 4. Wrap with plastic wrap, set aside, pour some more wine, and continue with the remaining eggs. 5. After the dough has rested for 10 minutes, take the first blob of dough and divide in two. Sprinkle the counter with semolina flour. Take the blob and run through the pasta cutter, beginning on the thickest setting (1). Run it through on 1, turn 90 degrees, and run it through on 1 again. Gradually work your way up to the thickness you desire. Enzo taught us to finish on 7, which makes a very delicate pasta. If you're brave enough, try going up to 9. I double dog dare you. 6. Once the pasta is the proper thickness, you have a giant lasagna noodle. Cut it in half to make two shorter noodles, sprinkle with semolina flour, and run through the fettuccine cutter.Unless, of course, you want to make lasagna. 7. Spread the noodles out on the drying rack. It is extremely important to separate the noodles and keep them from touching. With a little supervision, this can be a good step for young ones to help with. 8. Continue rolling and cutting pasta. When the pasta on the drying rack is somewhat dry, you can nest it or lay it on a plate. The drying process is to prevent the pasta from sticking, which causes large clumps of pasta. Confession time - as a kid, I loved finding lumps of spaghetti. I didn't know what al dente meant, but I liked the somewhat crunchiness of the middle of a pasta clump. I never said that I was a normal kid. Or adult. 9. Homemade pasta cooks extremely quickly. Boil a pot of water, and add the pasta for 60 seconds (2 minutes if your pasta was frozen). Drain immediately and toss with olive oil. 1. Pour olive oil in the bottom of a cast iron skillet (enough to cover). Add the tomatoes, garlic, and hot red peppers. Simmer for one to two hours. Note: the longer the sauce simmers, the better the house smells, and the hungrier you get. I think that Italians have been known to eat their own arms while waiting for dinner. 2. Five minutes before you're ready to eat, remove the garlic cloves and peppers and add the basil. We have cooked the sauce for a long time with the basil, but the basil develops a bitter taste if it cooks for too long. Add the pasta to a bowl (or plate the pasta), and put the sauce on top. This is not a traditional runny sauce, but rather olive-oil-with-tomatoes-and-basil-awesomeness. This meal should be served with a good Chianti and some wonderful artisan bread. Also, according to Enzo, our Italian pasta cooking guide, the meal needs to end with a little limoncello ("For the digestion"). For anybody in the Phoenix area or visiting the Phoenix area, I offer an Italian Feast class which includes all ingredients, walking through the process, the meal at the end, and of course the Chianti, Pavarotti, and limoncello. If you are interested, I am offering a discount for all Renaissance Dad followers. Please use the "Contact Form" at the bottom for more information. I will also offer a traveling Italian Feast class to any of my international readers, but you have to pay for my airfare and lodging. A special thanks to my friend Nam Ho, who took these photos. 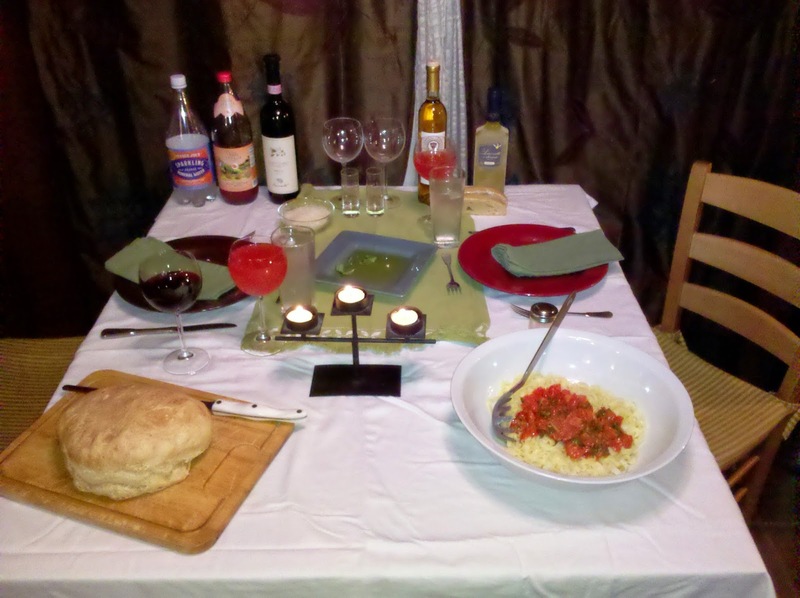 Nam and his wife Anna visited us recently and gave us an excuse to make this Italian feast. So that's another way to experience this - come for a visit!